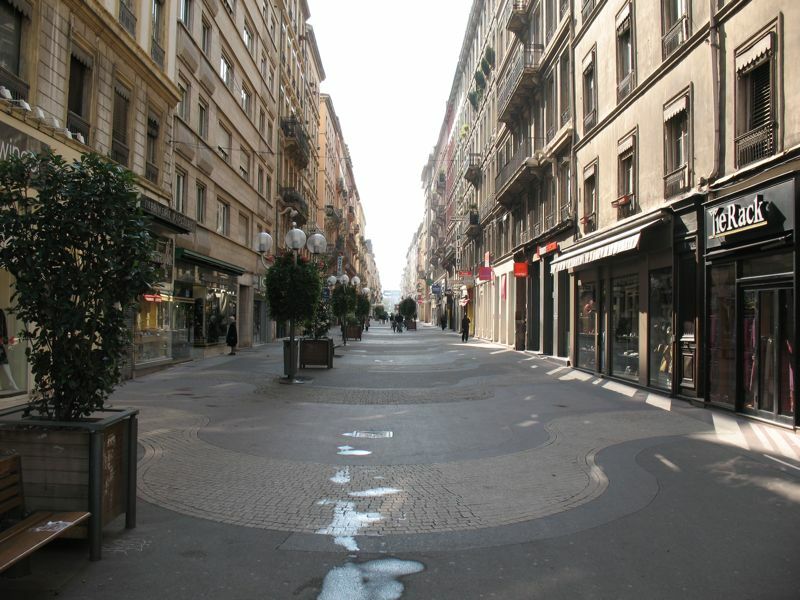 The last day in Lyon, before I head out tomorrow (too early) in the morning. Dave will stay on through Wednesday morning, but this is my last chance to enjoy this city. First glimpse of the morning from our balcony window. 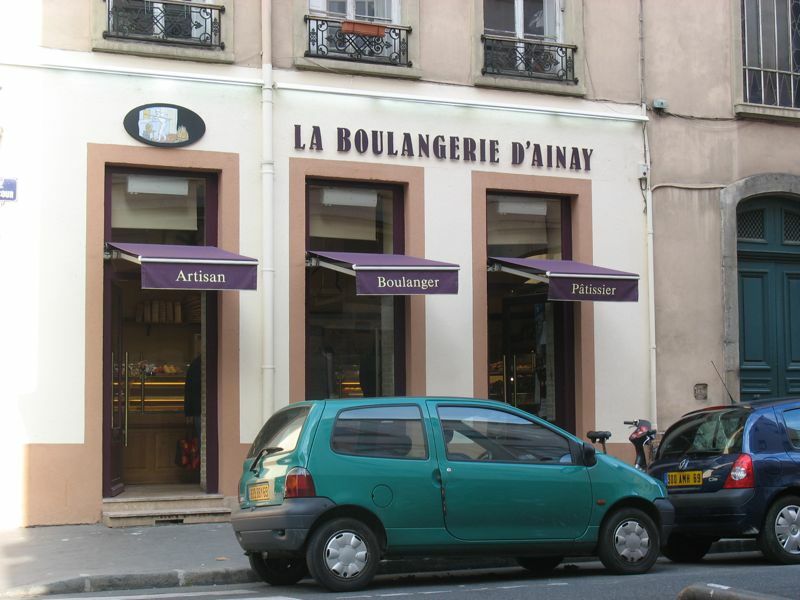 I pass on eating breakfast at Paul’s in Ampere Square (kitty-corner from McDonald’s, which is always packed at lunchtime) and head to the artisan bakery: Le Boulangerie D’Ainay, near my favorite little church–the Carolingan (which is how I refer to it). 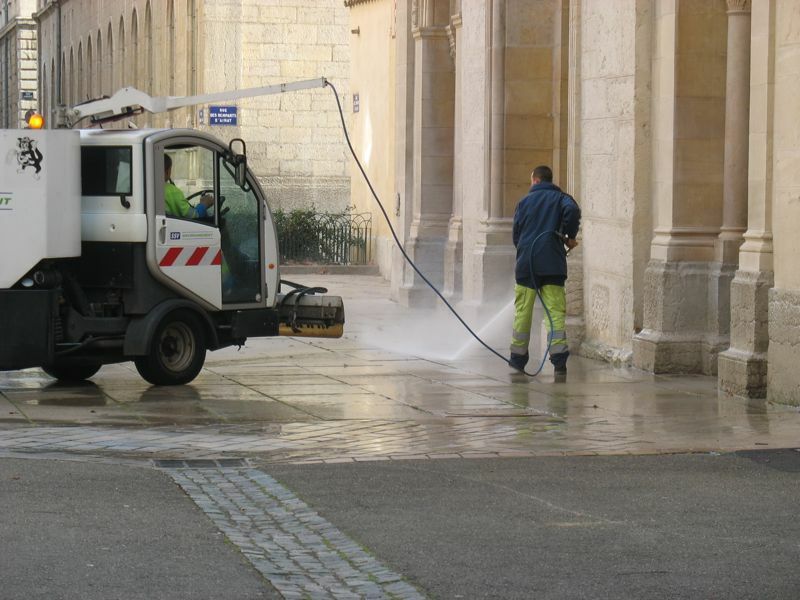 Cleaning the small square in front of the church, the squirter guy wields the hose from the washer truck. 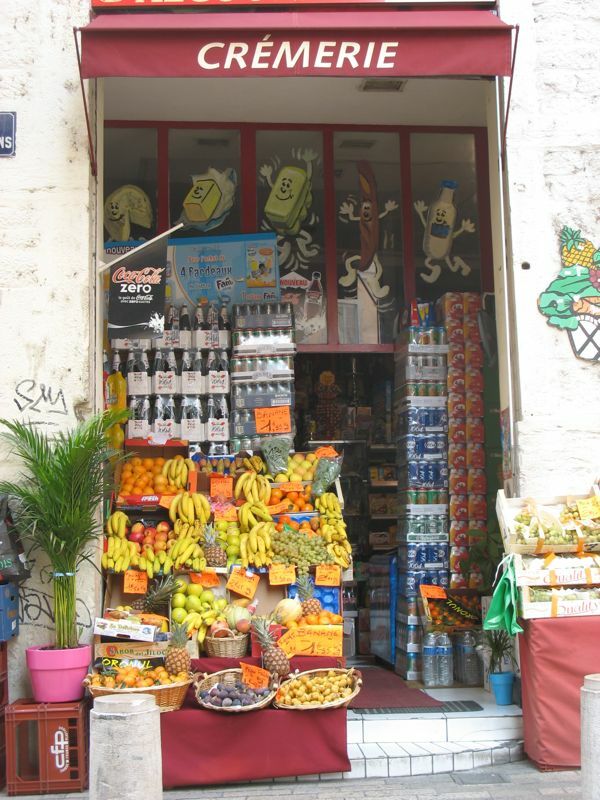 I pick up an orange drink at the market across the street. 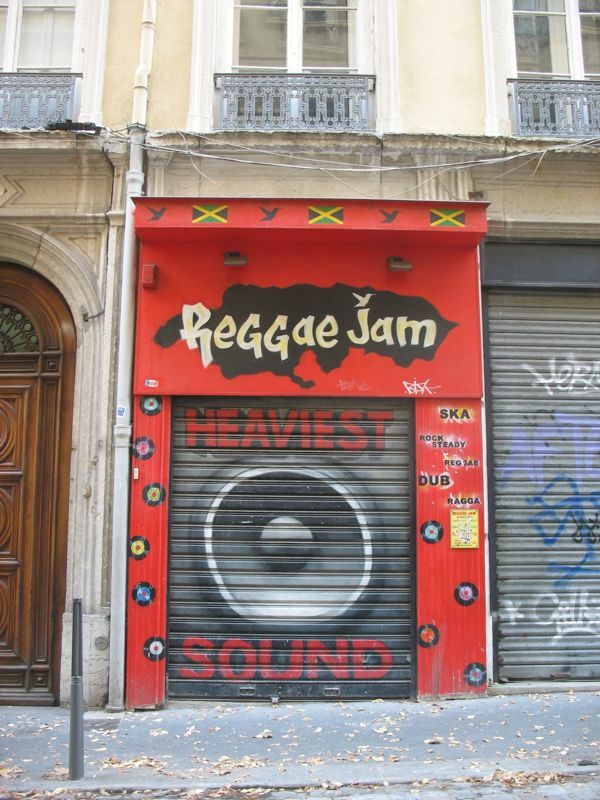 These are everywhere–about every four blocks and stock just about all you’d need. 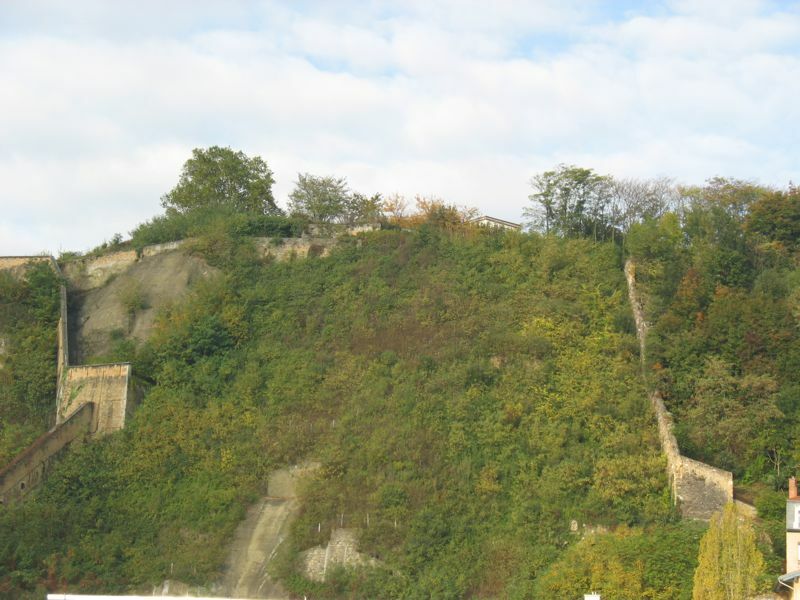 I walk to the river Saone and across from me are the ancient Roman walls of the upper city. At night, they are illuminated. I walk down the steps to the banks of the river, perch on one of the steps and enjoy my breakfast in the chilly morning air. 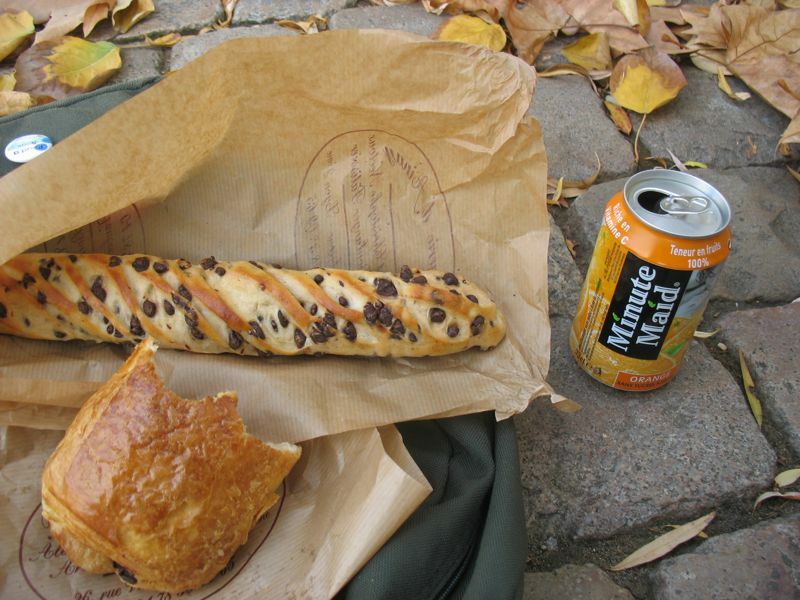 The pain du chocolate went first (the half-eaten roll in the front) and the other, a soft chewy bread studded with chocolate chips lasted me all morning and until my late afternoon lunch, one delicious sweet mouthful at a time. 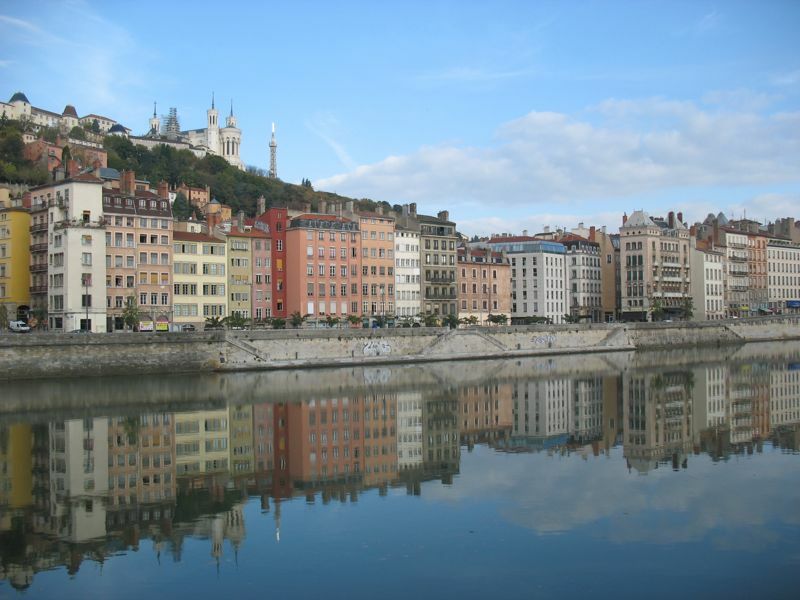 The sky is filled with clouds, the water like a looking glass, so I take some photos to remember Lyon by. The sun crept out for a few minutes from behind the clouds, and I was amazed at how it changed the colors of the walls and water. My artsy shot of the reflection. Upstream is this sturdy bridge, washed clean in the morning light. On Dave’s last day, he snapped it in the afternoon, the low warm colors reflecting off the underbelly of the bridge. Further up the banks, the Marche (market) was just getting going. See the other posts for photos from there, including the baskets at market. 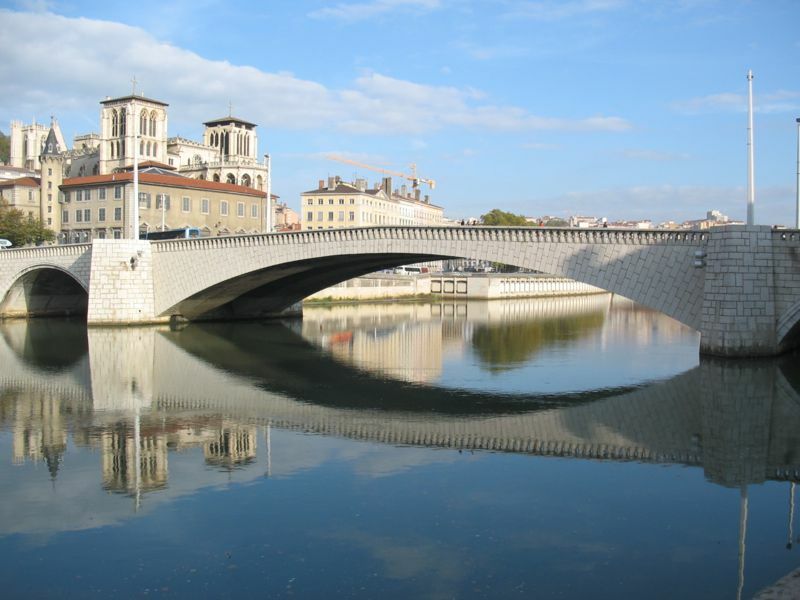 Pedestrian bridge leading from the left bank, where the marche was being held, to the right bank, and the old town of Lyon. 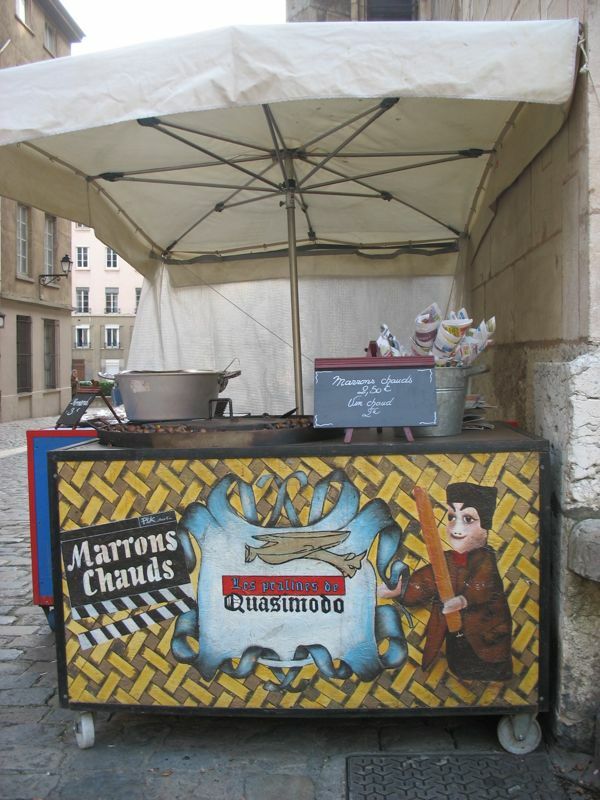 I spent some time in St. Jean church in the heart of Vieux Lyon (Ancient Lyon) and saw my first hot chestnut stand when I came out. Dave had told me about them (he had them while on his mission) and they are a sign that fall has arrived. I thought this one was interesting to get Quasimodo (from Paris) with Guignol the puppet (from Lyon). 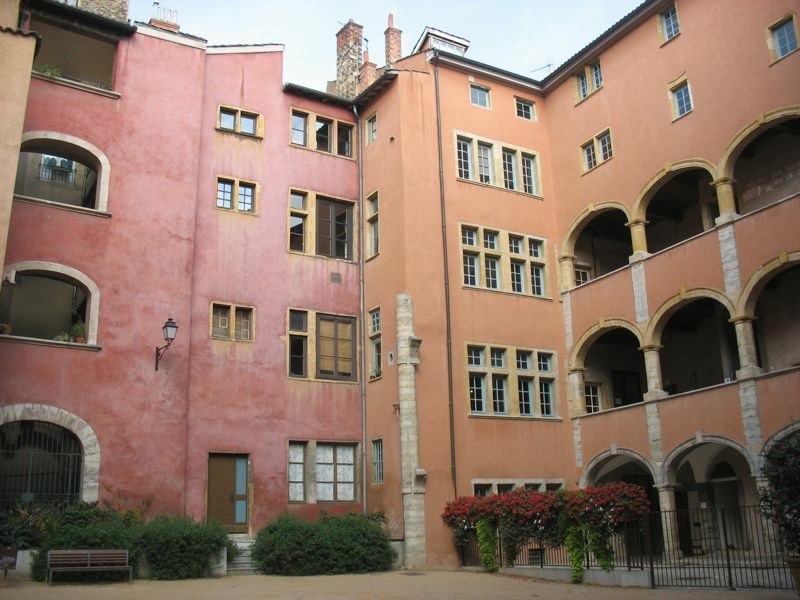 The Lawyer’s Court, in Vieux Lyon. 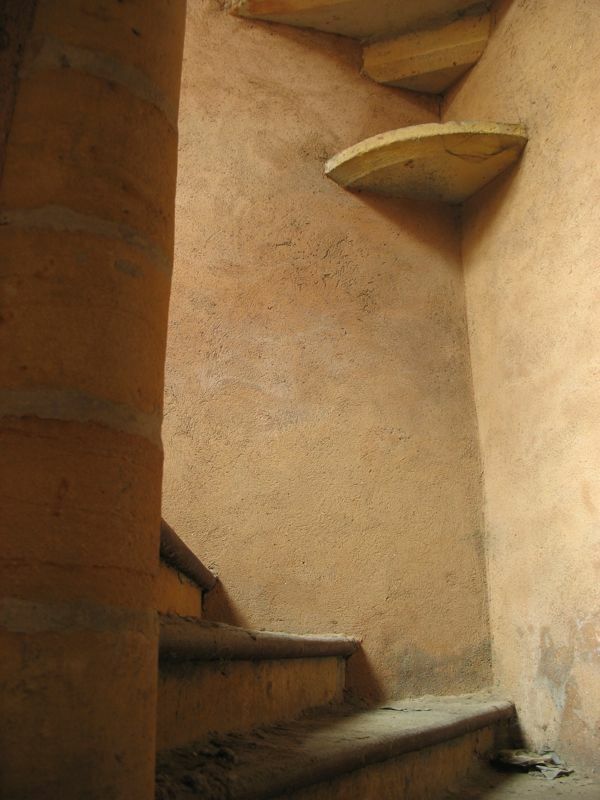 I pushed open the heavy wooden door in the corner of the Lawyer’s Court and saw this perfectly lit scene–I was a little shaky though, so it’s not completely crisp. 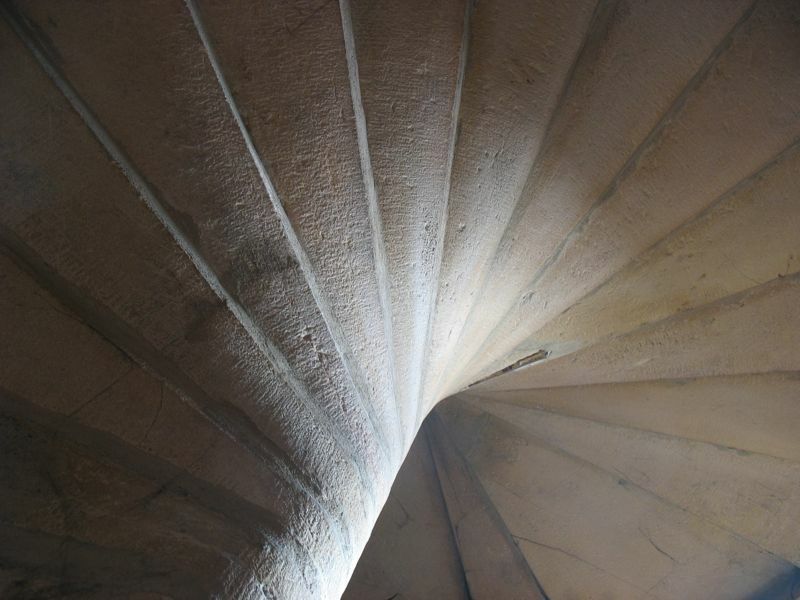 Below is the underside of the next floor’s staircase–all in stone. As I walked up the cobbled street, I remembered that I’d put my traboules and courtyards map in my backpack and pulled it out. 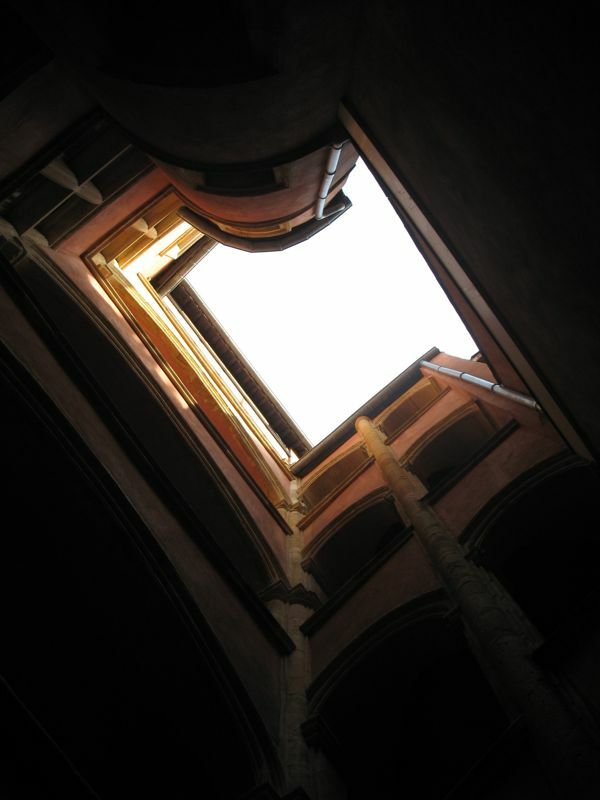 I ran into someone from IARC (actually, a wife of someone in Dave’s conference) and together we explored some old courtyards. 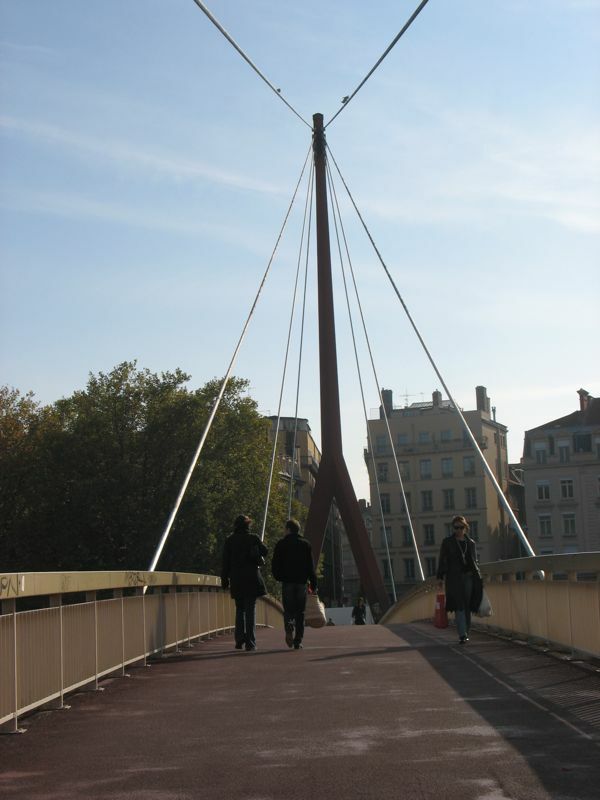 We parted, and I walked up to the next pedestrian bridge, crossed it and was headed to buy the Japanese toys that Christine and I had found earlier. But Wow! 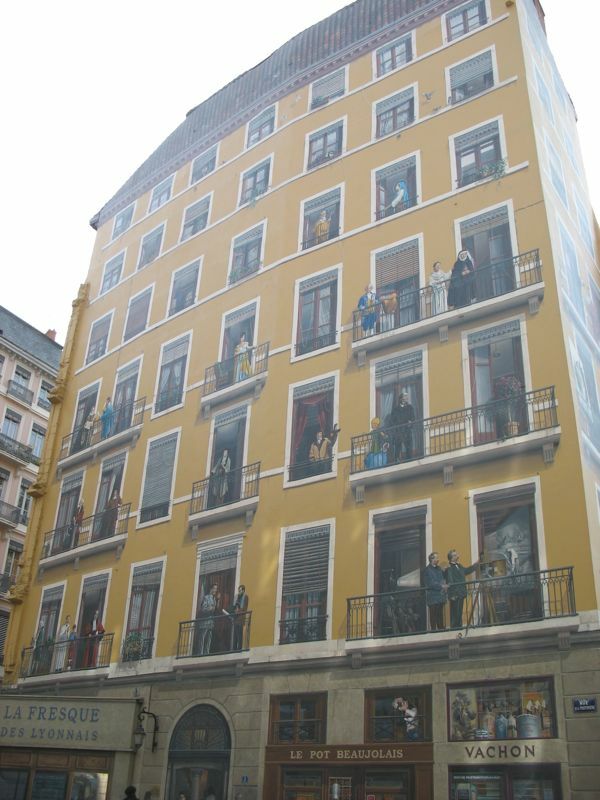 another painted building. 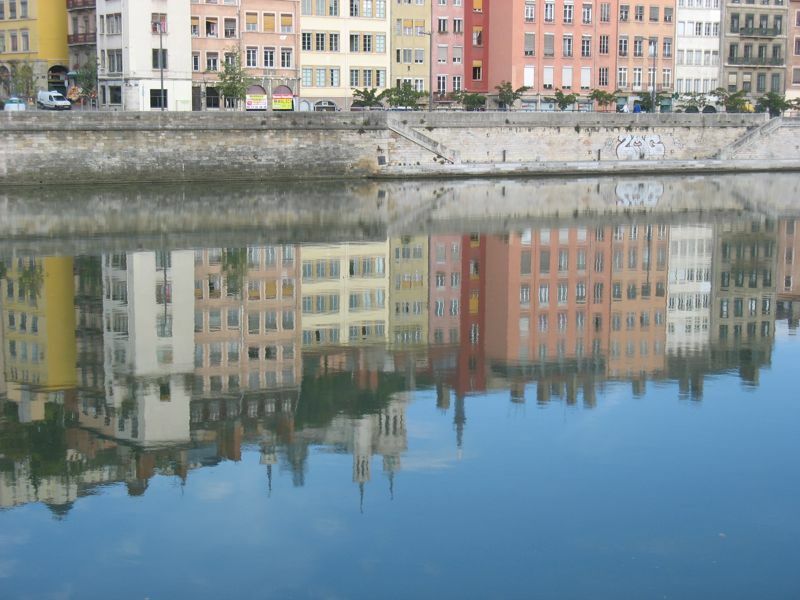 Lyon’s famous for these, if I haven’t already said so, and I’ve only scratched the surface in finding them. 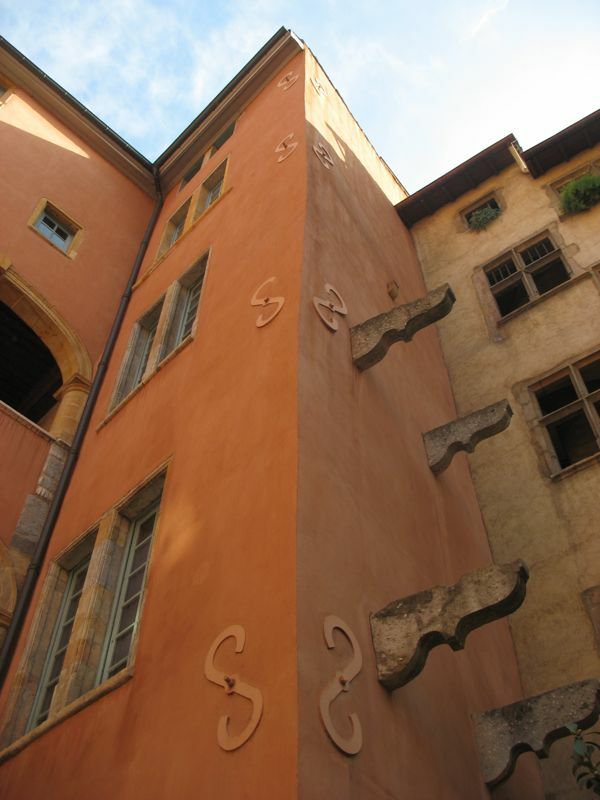 All these balconies and the people (from Lyon’s history) are all painted. 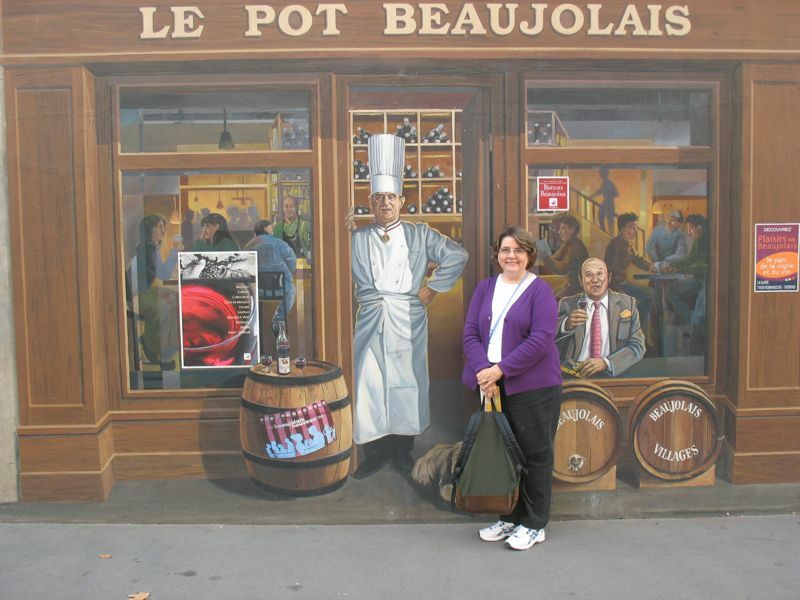 I posed with Paul Bocuse (in the chef’s regalia) in his doorway. A group playing Ring a Round a Rosie, only the song was different. They all dropped to the ground at the end, so same idea–different language. 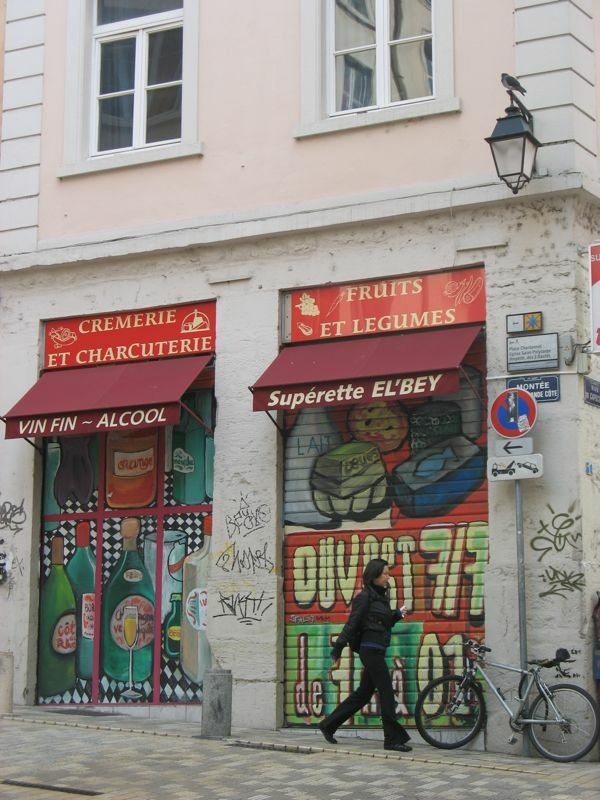 Although the large trompe l’oeil (trick the eye) buildings are the norm, even the smaller grocers get in to the act of painting. Both of these are painting, but the picture below–even though it could be a still life–is the real thing. 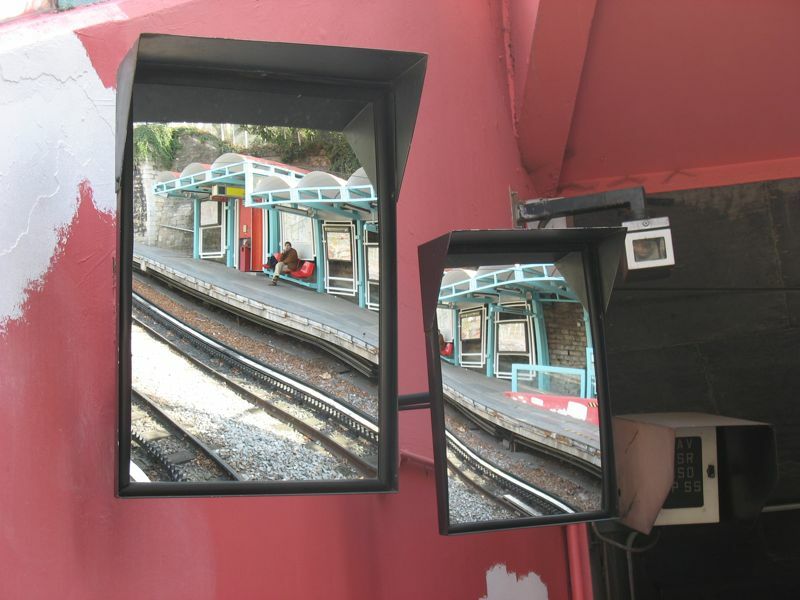 Not trompe l’oeil, but interesting, nonetheless. 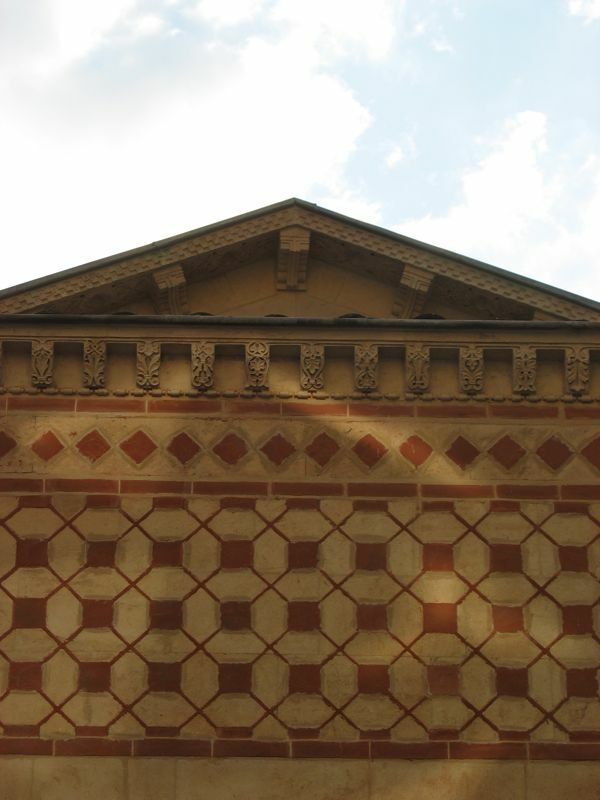 Each city has its themes, the things it replicates in some fashion or another, throughout its blocks and buildings. 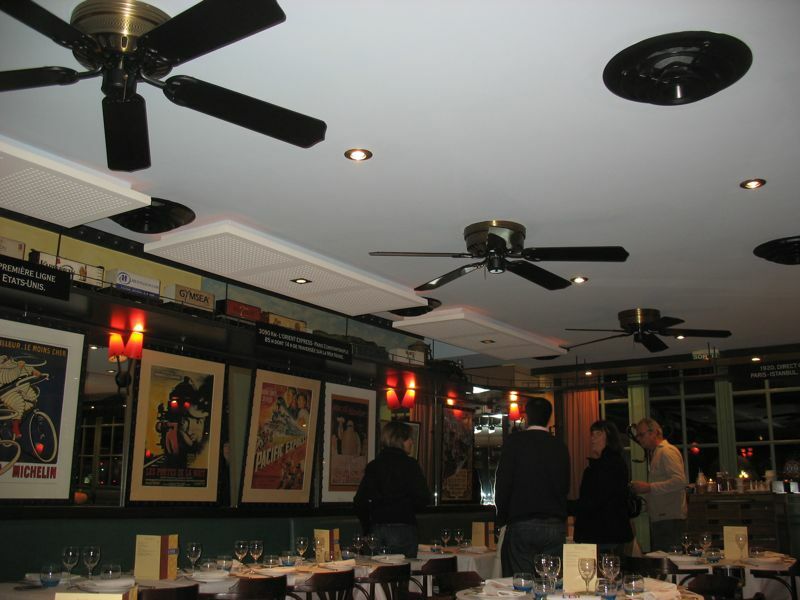 Painting is one thing that Lyon “does.” Good food is another. Christine and I found this store of collectible Asian toys and I was going back to retrieve a couple more. It’s not that the toy hunt was the object of this day, but I’ve found that sometimes if you are on the hunt for something different, it moves you out into different areas that you wouldn’t normally stay in as a tourist. Molly Qee was the item on the Big Game hunt today. I’ve finished off my breakfast roll, it’s now almost 2 p.m. and I’m tired. 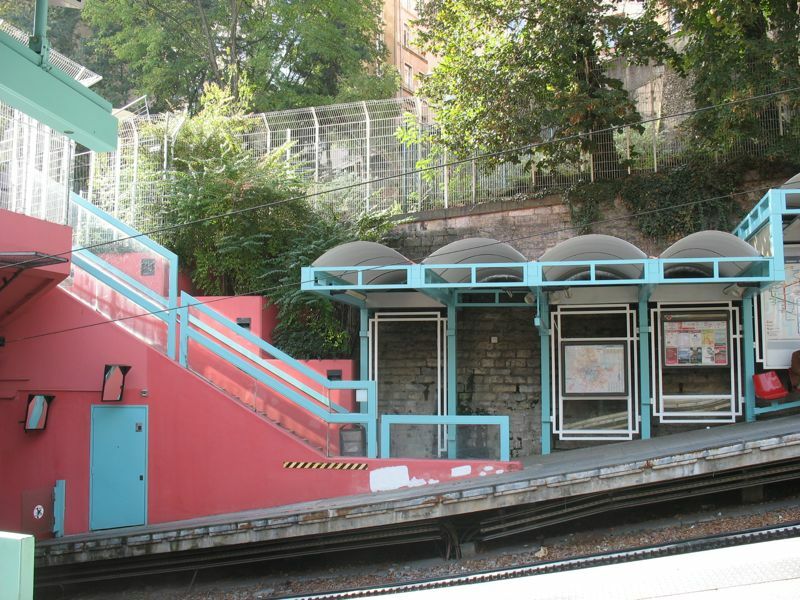 So I find the metro–this one’s a tramway on a hill and I like the colors and the angles. 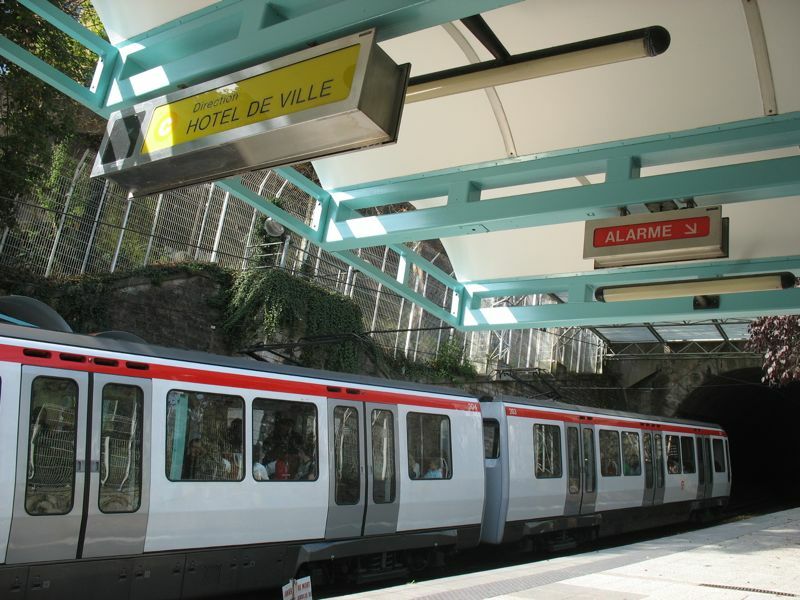 This train/tram is going into the tunnel, up the hill to Croix Russe. I’m waiting for the one to take me downtown. 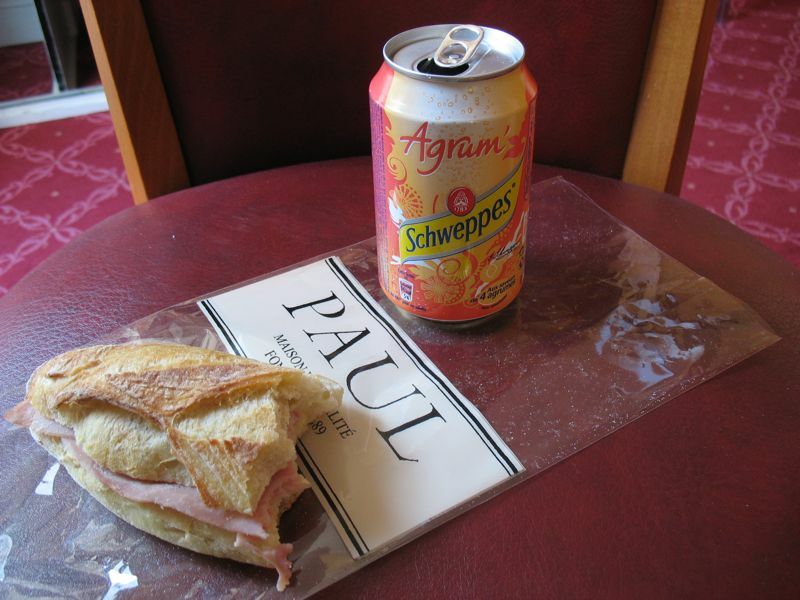 I exit “Ampere”, grab a Le Parisienne sandwich–buerre and jamon (butter and ham)–from Paul and the refreshing soda (recommended by Christine, who had it recommended to her by Jeremy) and head to the hotel. 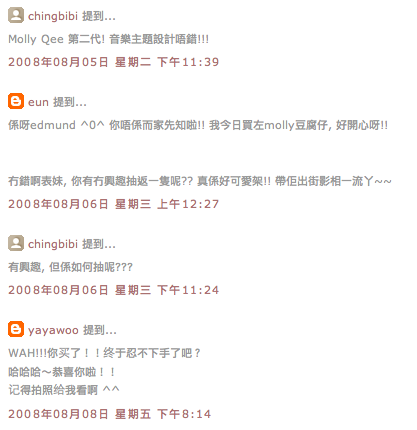 I blog a bit, then come to my senses and head out for the last afternoon. I stop by some favorite shops–one advantage of going somewhere twice is that you know some favorite shops to stop by twice. One of these is Tousoie, which Dave tells me means “all silk.” It’s a shop full of all kinds of tubular bolts of silks, some retailing for upwards of $100, all of which are gorgeous, some of which are hand-painted and embellished. 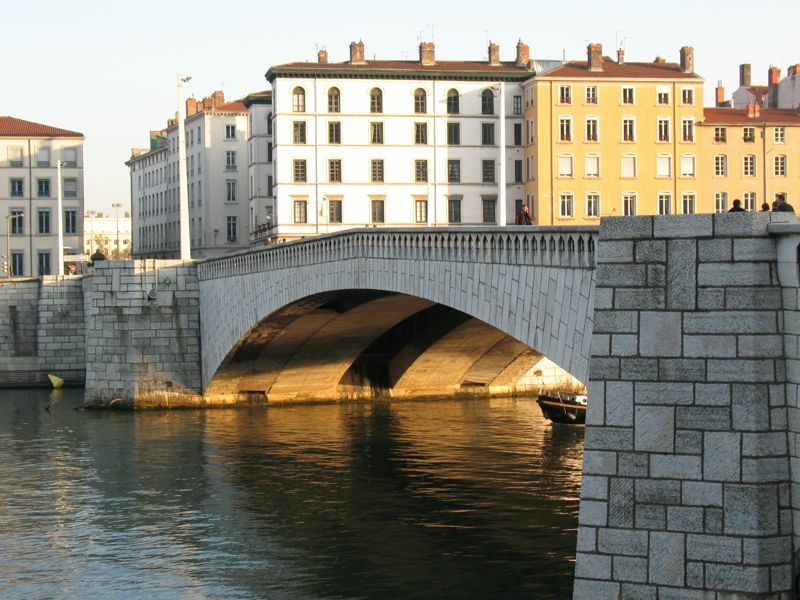 I head for the scarves, little luminous drapings of silk by which to remember Lyon’s once ubiquitous silk industry. 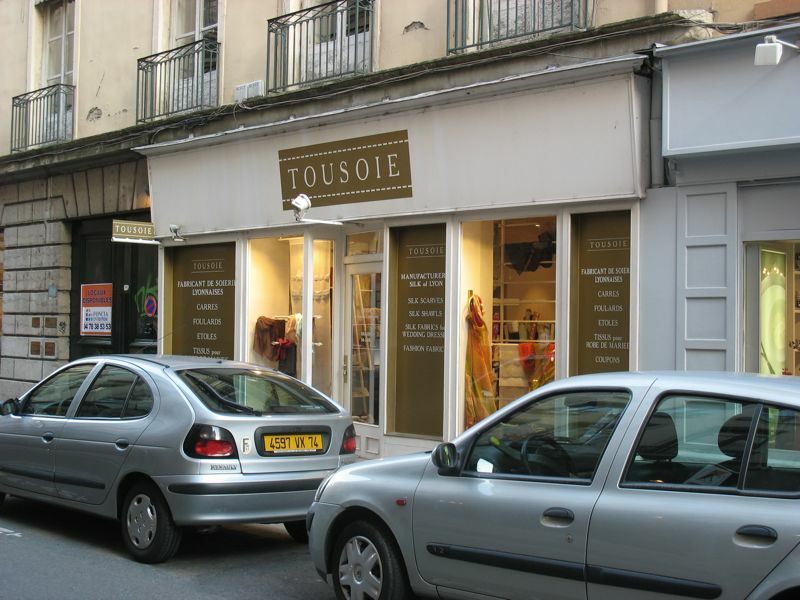 Tousoie is a “factory store,” a place where one of the last silk factories has a place to sell its wares. 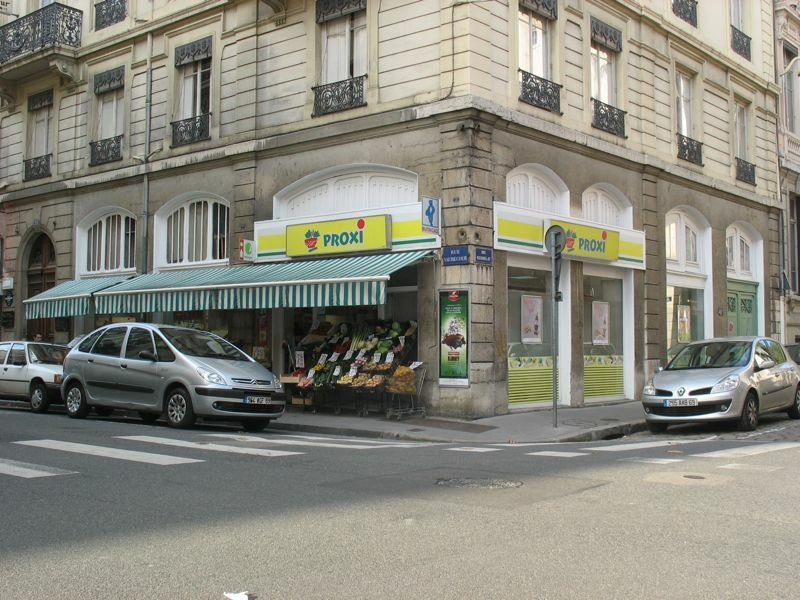 The shop owner also informed me (when I asked) that some of their silks went up to Paris, to the designers. I was fascinated with the two-color scarves; the warp thread in red and the weft thread in turquoise, or aqua. I must have looked confused because she said this color was named for the French ducks, who were this blue-green, and they say “A-Qua, A-Qua.” Her voice took on that sharp quacky-edge of something imitating a duck. The light went on inside my head. Our word aqua came from what French ducks say. Okey-dokey. I believe it. 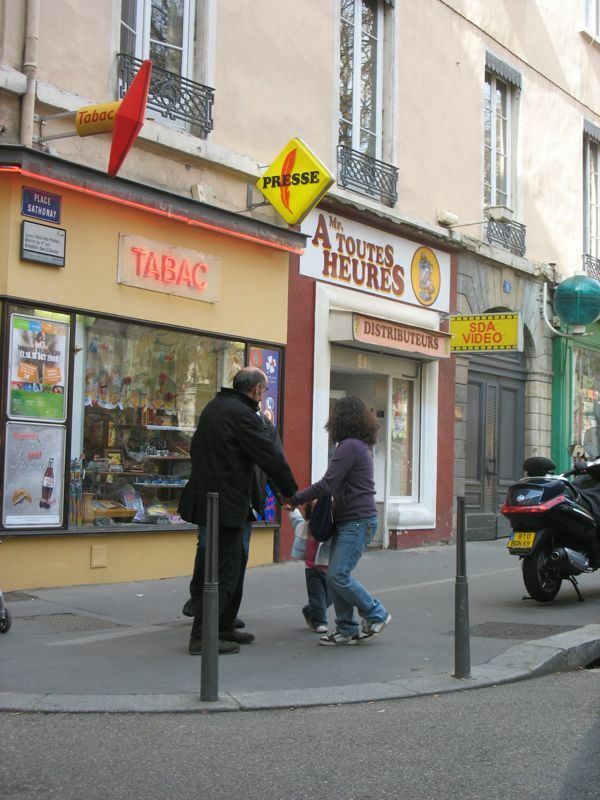 After strolling around France for a week, I see so much that is exported to our language and to our country (we return the favor by exporting McDonalds!). The food and fashion style are only the most visible. 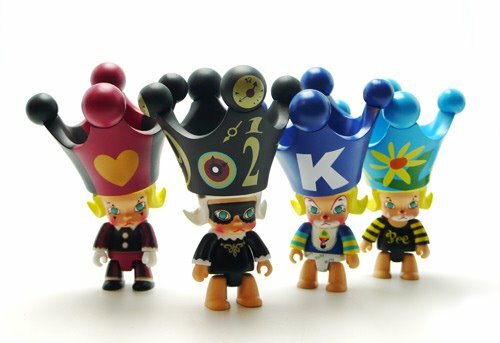 I think of how many people in my area say “wal-la,” not realizing this two-syllable sound is a mangled version of the French “voila” (see there). 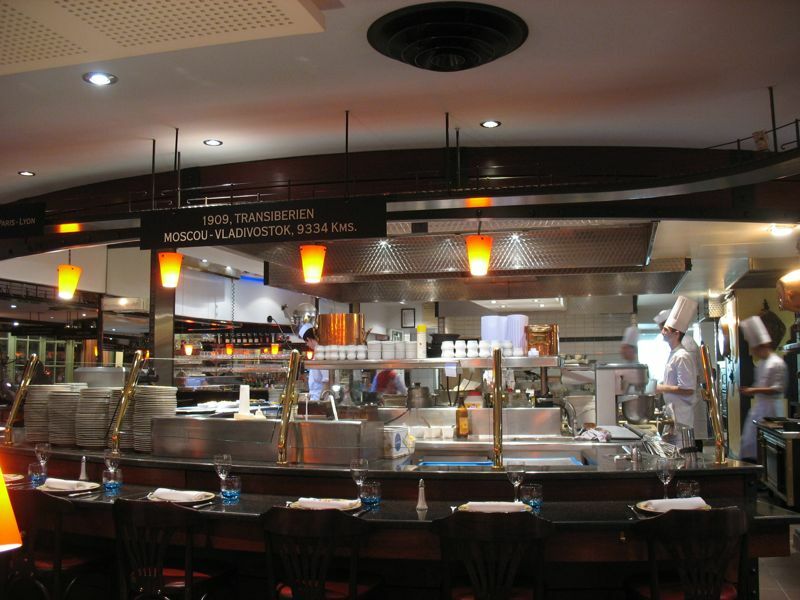 There’s a real temptation to assist with more importing by going crazy in the shops, but it’s getting dark, Dave will be coming home and we’re heading to the final Paul Bocuse restaurant for our last meal in France together. 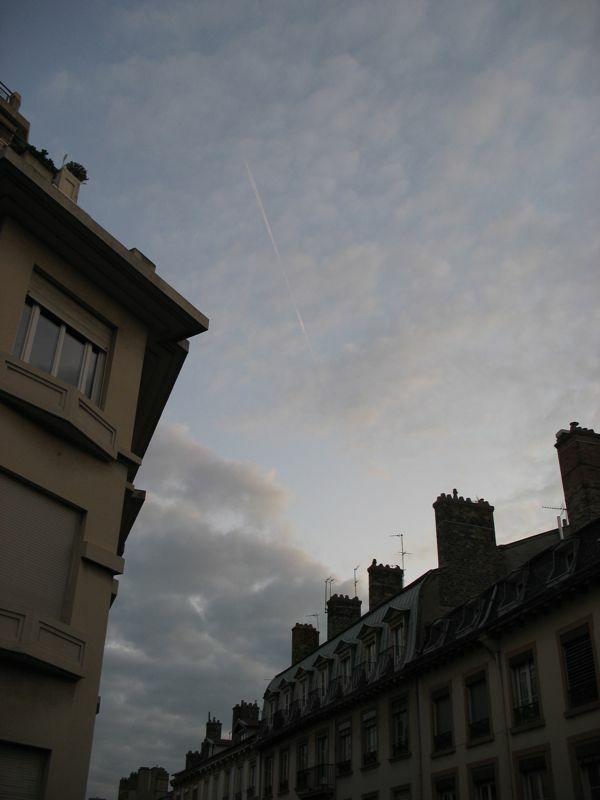 Our street, today. In Place Bellecour they were having an event of some kind, with several large white tents set up. Dave took these shots. 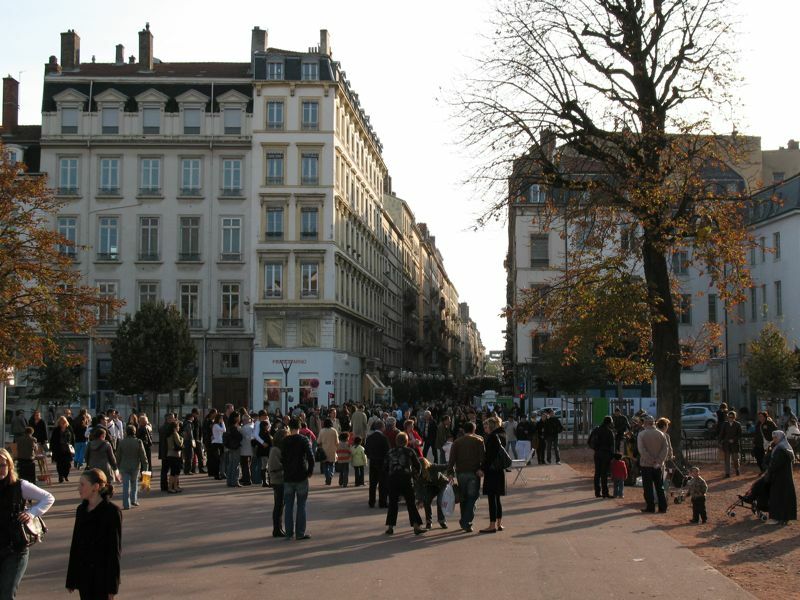 We change, get on the Metro and head for a new area of Lyon. 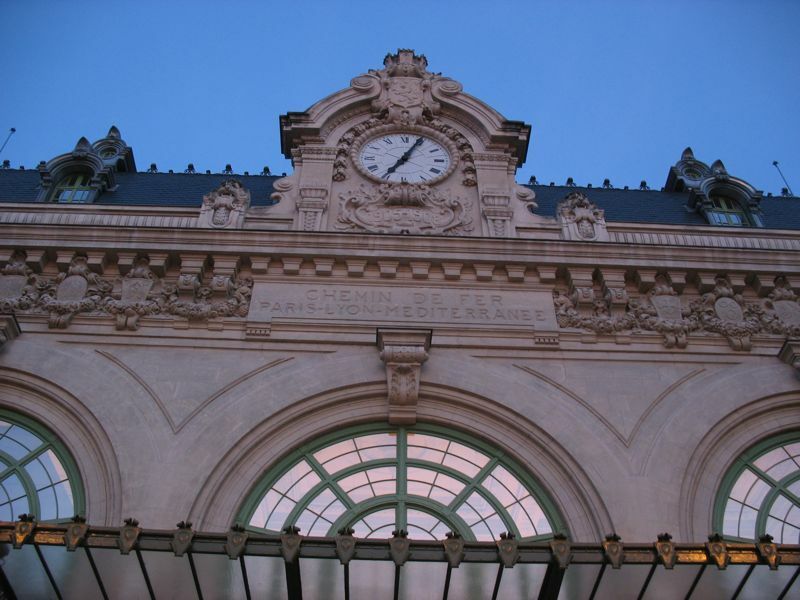 Upon exiting, we see that this was an old train station that has been converted to shops and restaurants. 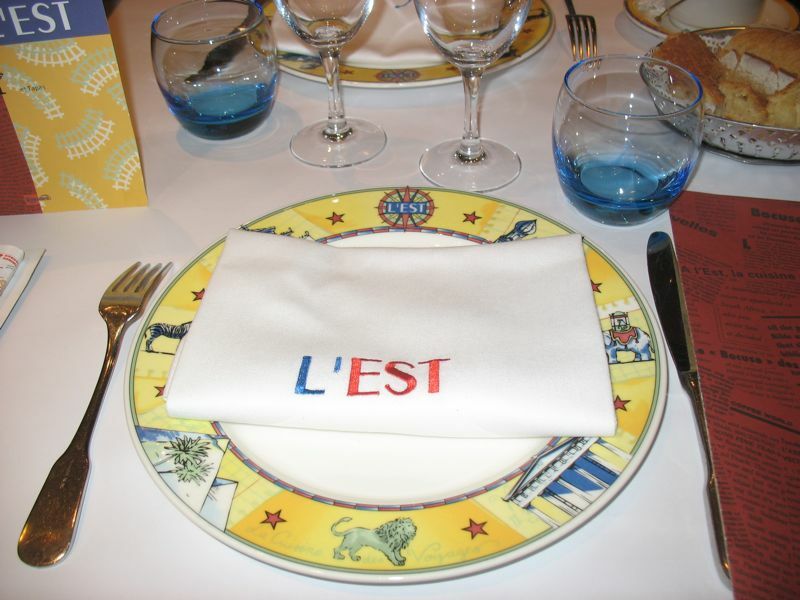 We’re at L’Est–the East–and it is called the food for “Les Voyages.” Around the ceiling’s perimeter runs a small electric train on a suspended track. 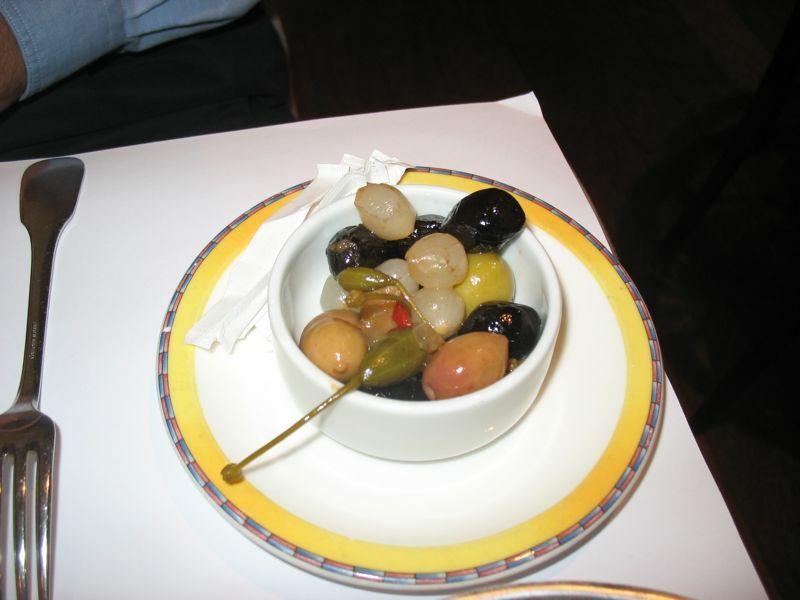 In each of the Bocuse brasseries, they bring out this little dish of marinated goodies. We couldn’t figure out the interesting one with the stem. They kept telling us it was a caper, but it was like none we’d ever seen. 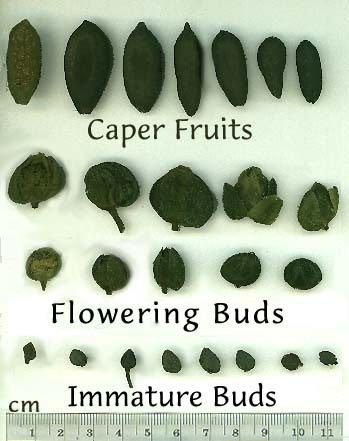 The best info I could gather is that it’s a “caperberry,” or a semi-mature flower bud. He had the white fish with potatoes and I had a salmon with a creamy sauce. We both won. We shared our desserts. 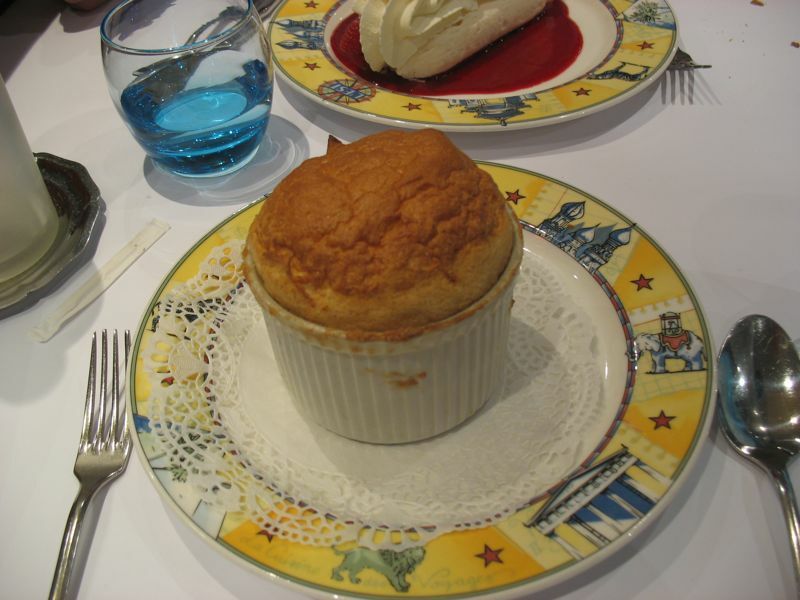 First up was the Grand Marinier souffle; I had to quickly take the photo as it was beginning to deflate. Sugar on top–delicious. 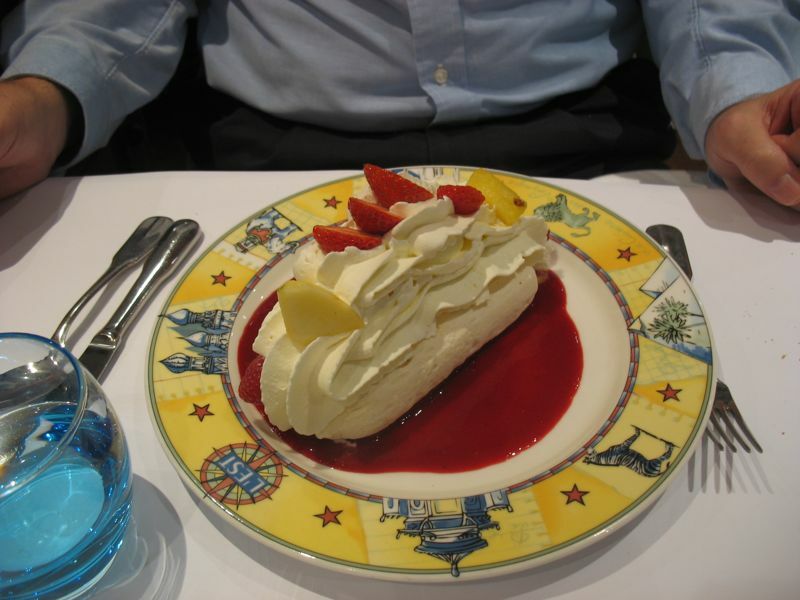 And a perfect closer: their merigne dessert with three types of sorbet, chantilly and fruit on top, with a berry coulis puddle around the outside. We walked home, vowing to eat gruel in Riverside to atone for this delicious food. 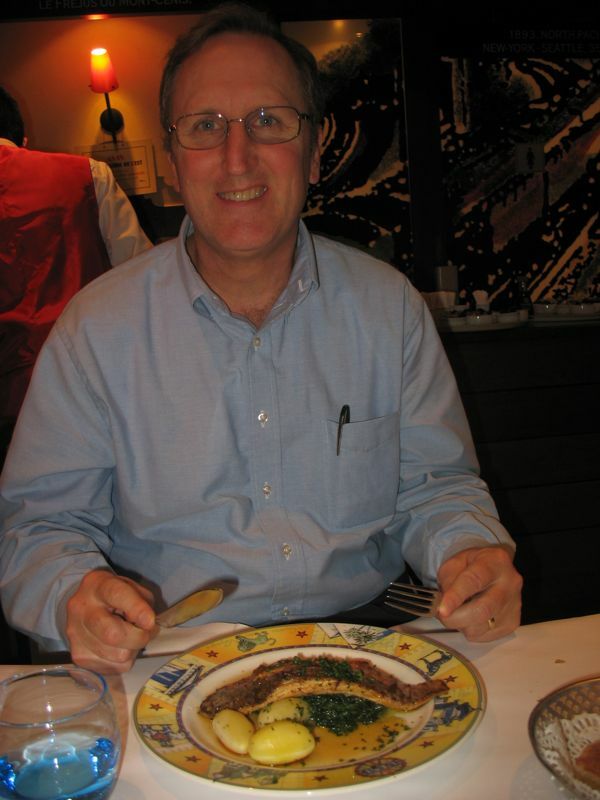 But the interesting thing is the size of the portions are mostly manageable–the don’t pile the food on the plate, overstuffing you as is the tradition in our mainstream restaurants here in the U.S. 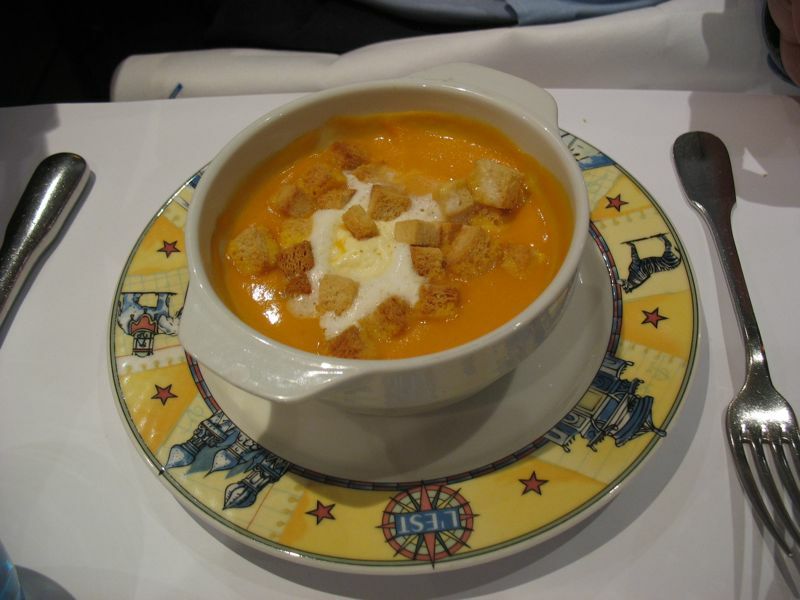 Sometimes smaller, more savory courses, satisfy better. 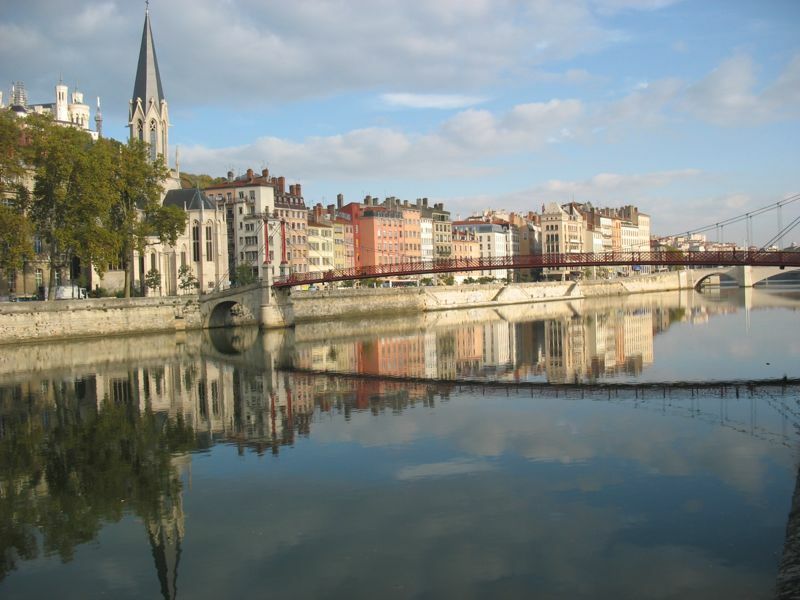 I hate to think of leaving Lyon–who knows if or when we’ll come back? It’s what Dave and I call a “second tier” tourist site, with not too many recognizable tourist sites to see. Because of this, the pace is slower and more relaxed. 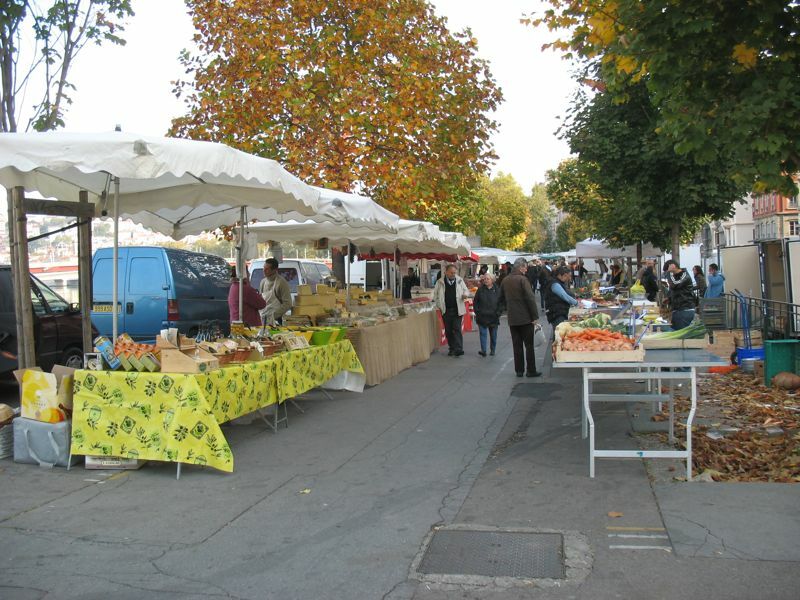 I could take a morning walking the Saone, browsing the markets because there’s not a rush to the next attraction. 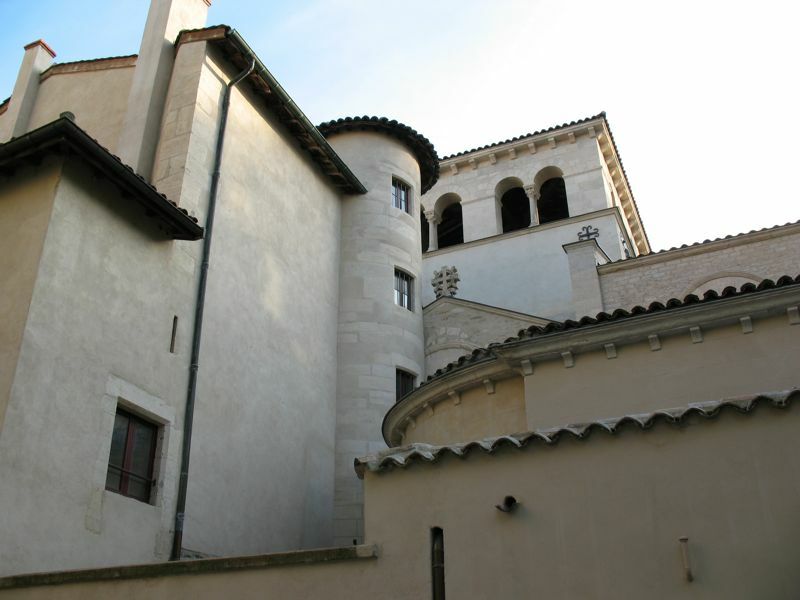 I could linger in the St. Jean cathedral, photographing the changing colors of the stained glass windows on the stone. 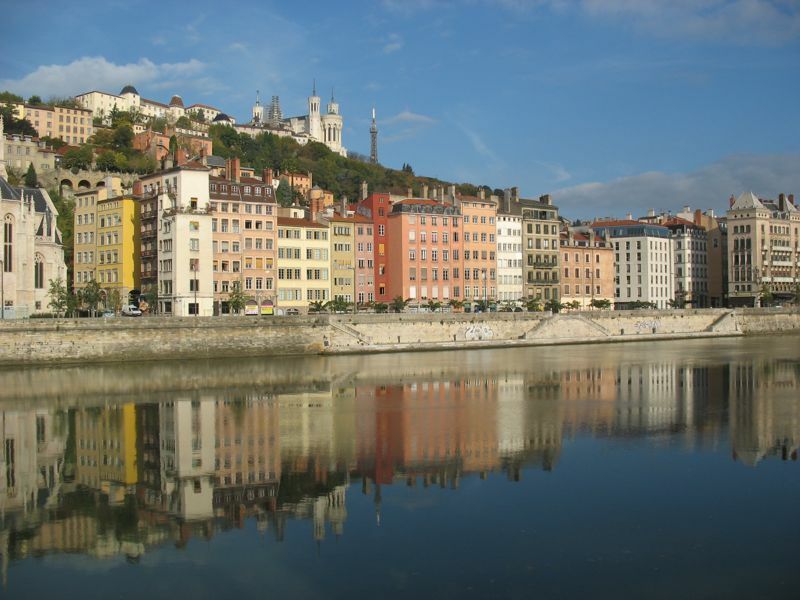 By the time I leave Lyon, I’m refreshed and renewed and ready to tackle the next difficult chore of my life–getting home!